For the Menudo Latin pop album, see Chiquitita (album). For other uses, see Chiquititas (disambiguation). "Chiquitita" (a Spanish term of endearment for a woman meaning "little one") is a song recorded by Swedish pop group ABBA. It was released in January 1979 as the first single from the group's Voulez-Vous album. Agnetha Fältskog sang the lead vocals. Originally, the track "If It Wasn't for the Nights" was going to be the album's lead single, but after "Chiquitita" was completed those plans were abandoned, and it would remain an album track. Voulez-Vous is the sixth studio album by the Swedish group ABBA, released in 1979. It features a number of hits such as "Chiquitita", "Does Your Mother Know" and "I Have a Dream" and showed the group embrace disco music, which was at its peak at the time. The album peaked at No.1 in a number of countries and was one of the top five-selling albums in the UK for that year. Åse Agneta Fältskog, better known as Agnetha Fältskog, is a Swedish singer, songwriter, musician and actress. She achieved success in Sweden after the release of her debut album Agnetha Fältskog in 1968, and reached international stardom as a member of the pop group ABBA, which has sold over 380 million albums and singles worldwide, making them one of the best-selling music artists in history. Gracias Por La Música is a Spanish-language compilation album by Swedish pop group ABBA, released on 23 June 1980 by Septima Records. Gracias Por La Música was originally released due to the unexpected surge in popularity for the group in Latin American countries such as Mexico and Argentina after the release of the Spanish-language versions of "Chiquitita" and "I Have a Dream" in 1979. These tracks were both released as singles and went on to become big hits. Encouraged by this success, the band therefore decided to record another eight tracks in Spanish and release a full-length album especially for the Latin American market. The songs selected were familiar hits, plus tracks that were thought to have a Latin flavour, such as "Move On" and "Hasta Mañana". "Chiquitita" proved to be one of ABBA's biggest hits. It was featured in a 1979 UNICEF charity event, the Music for UNICEF Concert , broadcast worldwide from the United Nations General Assembly. As a direct result of this event, ABBA donated half of all royalties from the song to UNICEF. "Chiquitita" hit #1 in Belgium, Finland, Ireland, the Netherlands, New Zealand, Spain, Switzerland, Mexico, South Africa and Rhodesia, and was a Top 5 hit in ABBA's native Sweden, the United Kingdom (peaking at #2 in both countries where Blondie's "Heart of Glass" was occupying the top spot),  Australia, Germany and Norway, making it the most successful single from the Voulez-Vous album in terms of global charts and one of the most famous charity songs ever. To this day, 50% of the proceeds from the song go to UNICEF in recognition of the "International Year of the Child" in 1979. The United Nations International Children's Emergency Fund (UNICEF) was created by the United Nations General Assembly on 11 December 1946, to provide emergency food and healthcare to children and mothers in countries that had been devastated by World War II. The Polish physician Ludwik Rajchman is widely regarded as the founder of UNICEF and served as its first chairman from 1946. On Rajchman's suggestion, the American Maurice Pate was appointed its first executive director, serving from 1947 until his death in 1965. In 1950, UNICEF's mandate was extended to address the long-term needs of children and women in developing countries everywhere. 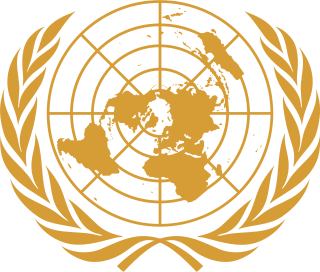 In 1953 it became a permanent part of the United Nations System, and the words "international" and "emergency" were dropped from the organization's name, making it simply the United Nations Children's Fund, retaining the original acronym, "UNICEF". Princess Anni-Frid Synni of Reuss, Countess of Plauen, better known by her nickname Frida, is a Norwegian-Swedish singer, songwriter, and environmentalist. She is best known as one of the lead singers of the Swedish pop band ABBA. Menudo from Puerto Rico had an Album named Chiquitita with a cover of the ABBA song Chiquitita. Leona Lewis performed the song on the British TV show The X Factor . "Chiquitita" was used as the opening song for the Japanese drama Strawberry on the Shortcake . Stephen Gately recorded his version for the Abbamania: Tribute to ABBA album in 1999, and the ABBA – Forever album in 2004. Chiquitita was later recreated as an instrumental song, played by pianist Raúl di Blasio in his 1991 album Alrededor Del Mundo. Zdenka Vučković (hr) recorded a Croatian rendering of the song for inclusion on her 1980 album Zdenka. The song is used in the 2017 film Three Billboards Outside Ebbing, Missouri . American singer Cher covered the song on her Dancing Queen album, released in 2018. A charity record is a release of a song for a specific charitable cause. The discography of Swedish pop music group ABBA consists of eight studio albums, two live albums, seven compilation albums, three box sets, four video albums, seventy-three singles, and thirty-three music videos. This list does not include solo material performed by individual members. 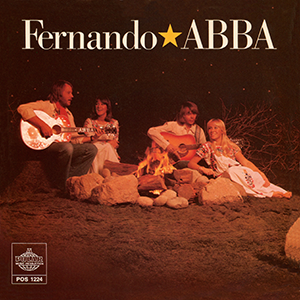 "Fernando" is a song by the Swedish pop group ABBA. It was the group's first non-album single and was released in March 1976 through Polar Music. The track was featured on the 1976 compilation album Greatest Hits in most countries, but was included on the group's fourth studio album Arrival in Australia and New Zealand. "Fernando" is also featured on the multi-million selling Gold: Greatest Hits compilation. The song is one of ABBA's best-selling singles of all time, with six million copies sold in 1976 alone. It is one of fewer than forty all-time singles to have sold 10 million physical copies worldwide, making it one of the best selling singles of all time. "One of Us" is the first single from Swedish pop group ABBA's final studio album The Visitors, their eighth for Polar, and their seventh for Epic and Atlantic. It was released in December 1981. The song is also included on the compilation albums Gold: Greatest Hits and Number Ones. "I Have a Dream" is a song by Swedish pop group ABBA. It was featured on the group's sixth studio album Voulez-Vous and released as a single in December 1979. The single became a big hit, topping the charts in many countries and peaking at No. 2 in the UK over the Christmas week of 1979. Twenty years later, Irish pop group Westlife released a version of the song which reached No. 1 in the UK over the Christmas week of 1999. "Gimme! Gimme! Gimme! " is a song by Swedish band ABBA. It was recorded and released in 1979 with "The King Has Lost His Crown" as the B-side. It appears on ABBA's Greatest Hits Vol. 2 album, as well as their best-selling album, Gold: Greatest Hits. 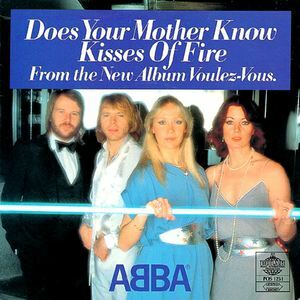 "Does Your Mother Know" is a song recorded in 1979 by Swedish pop group ABBA and was the second single to be released from their album Voulez-Vous. The B-side was "Kisses of Fire", which was also taken from the album. The song is notable as for its emphasis on male vocals, performed by Björn Ulvaeus, in contrast to the female lead singing in most of the group's material. "Thank You for the Music" is a song by the Swedish pop group ABBA. It was originally featured on the group's fifth studio album The Album (1977), and was released as a single on 6 November 1983, to promote the Epic Records compilation album of the same name. The song "Our Last Summer", which was originally featured on the group's seventh studio album Super Trouper (1980), was the B-side. The song was simultaneously released in Ireland, and later released in France, with the same B-side but different artwork, and the Netherlands, with "Medley" as the B-side. "Angeleyes" is a pop song written and recorded in 1978 by the Swedish group ABBA, and is featured on their sixth studio album, Voulez-Vous. Released as a double A-side with the title track of the album in July 1979, the lyrics and music were composed by Benny Andersson and Björn Ulvaeus. As one of ABBA's most popular tracks in the United Kingdom, the song was a successful hit, peaking at No. 3 on the singles chart. The Complete Studio Recordings is a box set of all of the studio material released by the Swedish pop group ABBA. It was released on 7 November 2005 and consists of 9 CDs and 2 DVDs, plus a full colour booklet with timeline and photos. Another booklet containing the complete lyrics was also included. "This Is Me" is a song by Demi Lovato and Joe Jonas from the Disney Channel television film Camp Rock and was featured on the soundtrack of the same name as the second and final single. It premiered on Radio Disney on June 6, 2008 and was released by Walt Disney Records onto the iTunes Store on June 17, 2008. A live version is also included on Jonas Brothers: The 3D Concert Experience. The single has sold 945,000 digital copies to date, according to Nielsen SoundScan. The song was written, produced and mixed by Adam Watts and Andy Dodd. "If It Wasn't for the Nights" is a song recorded in 1978 by the Swedish pop group ABBA for their sixth studio album, Voulez-Vous. Thank You for the Music is a compilation album by the Swedish pop group ABBA. It was released in November 1983 in the United Kingdom by the record company Epic. The compilation features 14 tracks, including the singles "I Have a Dream", "Chiquitita" and "The Day Before You Came". It also contains the Spanish version of "Fernando", which was the first time this version was released in the UK. Teri Harangozó was a Hungarian singer. She was one of the most influential female artists in Hungary in her time, whose independent album would influence many Hungarian singers after her. ↑ "ABBA – In The Arms Of Rosalita Lyrics". Moodpoint.com. Retrieved 2016-10-14. ↑ "Abba The World". Billboard. 8 September 1979. Retrieved 23 July 2018. ↑ "Nederlandse Top 40 – week 9, 1979" (in Dutch). Dutch Top 40 Retrieved 2017-12-31. ↑ "Dutchcharts.nl – ABBA – Chiquitita" (in Dutch). Single Top 100. Retrieved 2017-12-31. ↑ Whitburn, Joel (1993). Top Adult Contemporary: 1961–1993. Record Research. p. 11. ↑ "Forum – 1970 (ARIA Charts: Special Occasion Charts)". Australian-charts.com. Archived from the original on 2016-10-20. Retrieved 2017-05-07. ↑ "End of Year Charts 1979". Recorded Music NZ . Retrieved May 1, 2017. ↑ "Top Singles 1979". Music Week . London, England: Spotlight Publications. 22 December 1979. p. 27. ↑ "Harangozó Teri – Chiquitita". YouTube. 2015-08-25. Retrieved 2016-10-14. ↑ "Sinead O'Connor – Chiquitita (Official Video)". YouTube. 2009-03-08. Retrieved 2016-10-14.